This quaint cottage is tucked away in a quiet neighborhood just blocks away from downtown New Buffalo. A cozy feel welcomes guests as they step into this well cared for, whimsically decorated home. The vaulted ceilings and open concept kitchen/dining area gives a spacious feel and the wall to wall windows lets the natural light pour in, creating a bright and cheery environment. The kitchen is stocked with all the basics and has plenty of counter space, including a peninsula breakfast bar with seating for 2. The dining room features a beautiful wood table which seats up to 8. The living room, with large comfortable sectional couch situated around a gas fireplace and mounted TV, is off of the dining room and has a set a French doors to close it off from the rest of the home for extra privacy. Two comfortable bedrooms and a full bathroom are adjacent to the kitchen. One bedroom is furnished with a queen bed and the other has two twin beds. Wireless high-speed internet and a BluRay player allow you to watch your Netflix type programming. 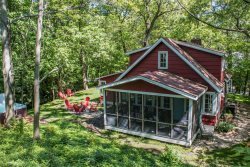 This cottage offers a front deck with cafe tables and chairs overlooking a large fenced in yard with lush lawn, mature trees and an in ground fire pit surrounded by comfortable Adirondack chairs. Guests will also enjoy the rear patio complete with a grill for outdoor cooking and a table with seating for four perfect for al fresco dining. In addition, the rear patio has an outdoor shower giving guests the opportunity to shower off the sand from their visit to New Buffalo public beach, which is within walking distance or a quick car ride away. For those guests who love a nice stroll, downtown New Buffalo is only a two blocks away and offers great shopping and delicious eateries such as Bentwood Tavern, Stray Doy, David's Deli, and Casey's, just to name a few. If a low-key peaceful getaway is what you are looking for then Happy Thoughts Cottage is for you! Everyone from the maid to the yard man were top notch. No complaints. Could not have been better. Wanted for nothing. It was a great experience. Very understanding, patient and knowledgeable. Spectacular. We'd be happy to stay there again, at any time of the year. Everyone I talked with was informative and responsive, a smooth guidance into our stay at Happy Thoughts Cottage. The Happy Thoughts Cottage is a delightful find. We shared the cottage with another couple. Clean and accommodating. Anxious to plan another get away to the area, my wife and I will be back over winter and just hunker in. The cottage is wonderful! This group of women is thrilled to have been part of the inaugural season of Happy Thoughts cottage! It was comfortable, charming, clean and convenient and one of our favorite rentals in Harbor Country. On one rainy morning, we discussed how we wouldn't even mind spending the day inside with a good book and just enjoying the charm of the this lovely home! One of the first things we did on arrival was to bring our drinks and snacks outside to the relaxing sitting area around the firepit and and discuss our plans for the weekend. Everything was impeccably clean, both inside and out. We enjoyed some favorite local restaurants Stray Dog and Casey's and some delicious crepes just up the street from the house. An easy drive into Three Oaks to Journeyman Distillery, Staymakers restaurant, shopping and a movie; and the usual treks up and down Red Arrow for some unique antique stores, gift shops and eateries. Thanks, Dale and Lisa, for opening your beautiful home for rental and for your great communication in planning our trip.